AN extra 200 people are needed to donate blood in Edgewater this Easter to boost blood supplies for cancer and trauma patients. Platelets – a vital clotting agent in blood – are needed to treat patients undergoing chemotherapy and to combat life-threatening bleeding from road trauma and other emergency situations. However, they only last for five days so a constant supply is needed. Burns Beach donor Henry Milner, who is involved with many areas of the Red Cross, urged others in the community to roll up their sleeves. The 64-year-old said he had been donating blood since he was about 18 in Ireland and continued when he moved to Australia. He now donates plasma every two weeks. “I’m very lucky health wise and when you feel well, it’s nice to be able to help look after others,” he said. “I will continue to donate as long as I possibly can or until they throw me out. He said it was so simple that he usually fell asleep during his appointment. 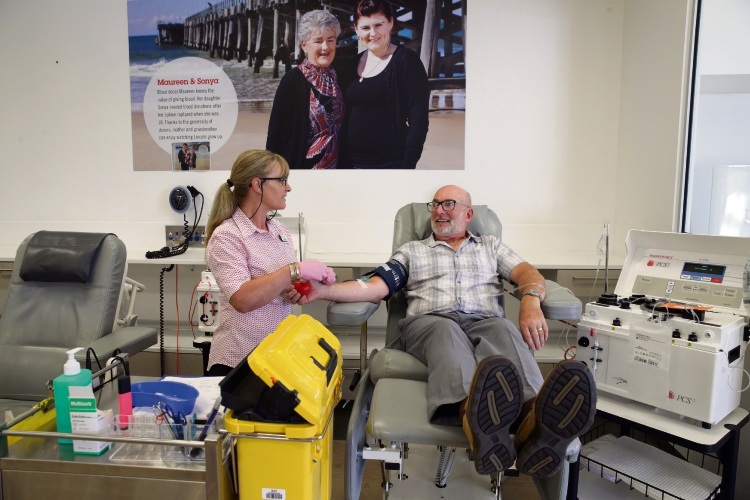 Australian Red Cross Blood Service spokeswoman Jessica Willet said there was a short supply of donors before, during and after the Easter holiday. “Around Easter many regular blood donors are away, which means blood supplies can dip,” she said. Meanwhile, several local gyms have been recognised for encouraging the donation of blood plasma. Jetts Fitness was named the winner of the Blood Service WA Plasma Growth Awards for 2017 following the success of the inaugural Jetts Blood Challenge. The state-wide challenge resulted in 203 plasma donations out of the 384 donations from Jetts members, staff, family and friends across its 44 WA gyms in 2017. Jetts WA director John Rock said the enthusiasm of everyone involved “completely exceeded” his expectations. “We even had leader boards set up in each gym to keep track of which particular gym had achieved the highest number of donations,” he said. According to the Blood Service, WA businesses donated more than 13,000 litres of blood in 2017, equating to 21 per cent of all donations. This year, it hopes more businesses will follow in Jetts’ footsteps and that figure will increase. “Our goal is to reach 25 per cent of blood donations in WA coming from businesses and community groups as that will make such a huge difference,” community relations manager Yvonne Stickland said. The Jetts Blood Challenge is running again this year.